The National Gallery, London (Bought with the aid of a contribution from the J. Paul Getty Jr Endowment Fund, 1986). 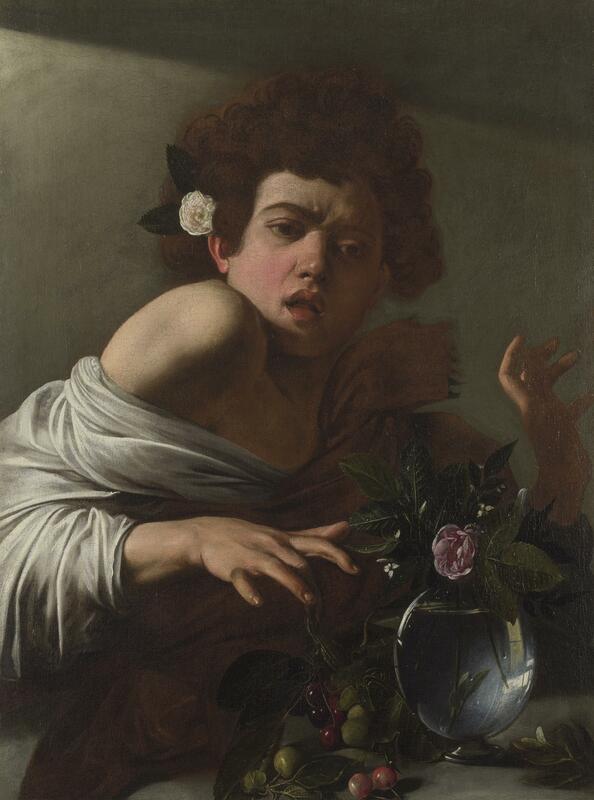 A painting by the famous Italian artist Caravaggio (1571-1610) is on display in the Prince William V Gallery in The Hague (the Netherlands) until Sunday 8 December 2013. The picture is Boy Bitten by a Lizard from The National Gallery in London. There are no paintings by Caravaggio in any Dutch museum collection, so this is a unique opportunity to admire one of his works in the first public art collection in the Netherlands. Caravaggio is famous for his dramatic depictions. His paintings are captivating, because of their combination of action, emotion, naturalism and vivid contrasts of light and shade. These qualities are very much in evidence in his painting of a boy being bitten by a lizard. The boy's expression is one of utter shock - so much so that you can almost hear the young boy's cry of surprise; his anguish is palpable, even to the viewer. Caravaggio would become both adored and reviled for powerful depictions such as this. Caravaggio's raw realism, dramatic contrasts of light and shade and naturalistic colours made a great impression in Rome shortly after 1600. Everyone was impressed with his new, striking manner of painting, and Caravaggio's lifelike depictions quickly became hugely popular. In the first half of the seventeenth century, Caravaggio had followers in Italy, as well as France, Spain, and the Netherlands. He is the only innovator in the history of art to have lent his name to a widespread international artistic movement: Caravaggism. Accordingly, two examples of this Caravaggism from the Mauritshuis's collection, one by Rubens and one by Honthorst, hung alongside Caravaggio's painting. Over the coming years a series of exhibitions will be held in the Gallery, each consisting of a single painting. A masterpiece that is not represented in Dutch public collections will be displayed for a limited period of several weeks. These paintings have been lent by internationally renowned museums. The Caravaggio from The National Gallery in London is the first in this series of masterpieces. The Gallery is a hidden gem in The Hague's historical centre. Stadholder William V, Prince of Orange-Nassau, had it built in 1774 to display his collection of paintings. The walls were hung full from floor to ceiling, so that the splendour of his collection could be shown to best advantage. The Gallery has been restored to its former glory and around 150 Old Masters (including Jan Steen, Rubens and Paulus Potter) now hang side by side once again. Crystal chandeliers, silk wall coverings and lavish curtains complete the princely atmosphere, just as they did in the eighteenth century.